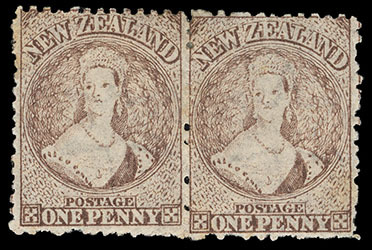 New Zealand, 1871, Queen Victoria "Chalon Head", 1d red brown, perf 12½, Large Star watermark, horizontal pair, o.g., hinge remnants, well centered with bright color and paper, Very Fine. Scott No. 39 var. Campbell Paterson No. A1q (2). SG No. 132 £550 as singles ($720). 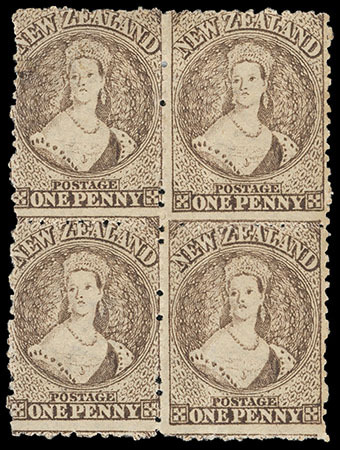 New Zealand, 1871, Queen Victoria "Chalon Head", 1d red brown, perf 12½, moderate plate wear, Large Star watermark, block of four, o.g., couple hinge remnants, well centered with bright color, Very Fine. Scott No. 39 var. Campbell Paterson No. A1q (2). SG No. 132 Estimate $300 - 400. 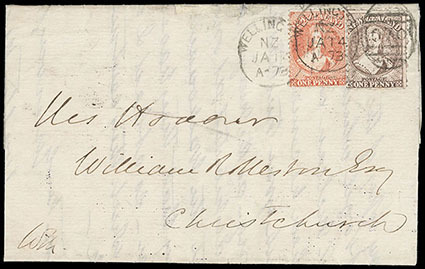 New Zealand, 1871, Queen Victoria "Chalon Head", 1d red brown, perf 12½, Large Star watermark, block of thirteen (R. 7/6-12 & 8/6-11) with slight plate wear, tied by multiple strikes of "Christchurch, OC 21 '72" duplex with "C" barred oval on large blue linen-backed piece, small imperfections, Very Fine and rare large used multiple, Joseph Hackmey, Spink Shreves, May 2010, lot 2462. Scott No. 39 var. Campbell Paterson No. A1q (2). SG No. 132 Estimate $400 - 600. 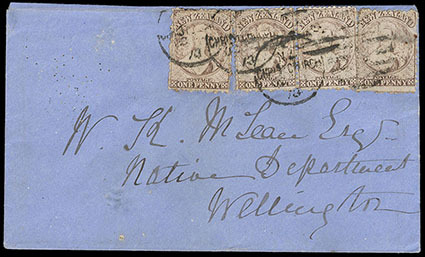 New Zealand, 1871, Queen Victoria "Chalon Head", 1d red brown, perf 12½, Large Star watermark, pair and two singles, tied by strikes of "Christchurch, OC 1, 73" duplex on blue cover to Wellington, Oct. 3rd arrival backstamp; right stamp faults, Very Fine and rare use of four 1d stamps paying the ½-1 oz. inland rate, Marcel Stanley. Scott No. 39 var. Campbell Paterson No. A1q (2). References: Illustrated in Odenweller as fig. 11.3, p. 165. 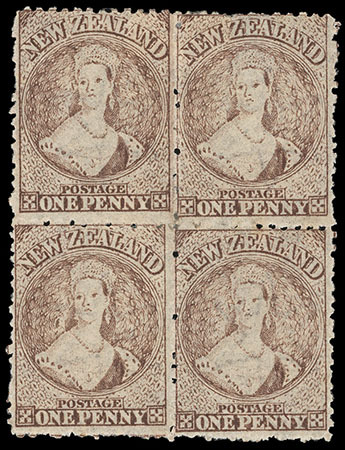 New Zealand, 1871, Queen Victoria "Chalon Head", 1d brown, perf 12½, early plate wear, Large Star watermark, block of 4 (R. 18-19/2-3) Pos. R. 19/3 showing re-entry, o.g., hinge remnant, strong color, light vertical crease through right pair, fresh and F.-V.F. Scott No. 39. Campbell Paterson No. A1q (3). SG No. 132a Estimate $300 - 400. New Zealand, 1871, Queen Victoria "Chalon Head", 1d brown, perf 12½, Large Star watermark, used in combination with 1864-67, 1d pale orange vermilion (111), vertical pre-use wrinkle, both tied by two strikes of "Wellington, JA 14, A- 73" duplex with "070" barred oval on folded letter to Christchurch, arrival cds (1.15) across join on reverse; cover repair at top edge, Very Fine appearance, Joseph Hackmey, Spink Shreves, February 2009, lot 1493. Scott No. 39. Campbell Paterson No. A1q (3). SG No. 132a Estimate $750 - 1,000. A VERY ATTRACTIVE AND RARE MIXED-ISSUE FRANKING FOR THE 2D INLAND LETTER RATE. 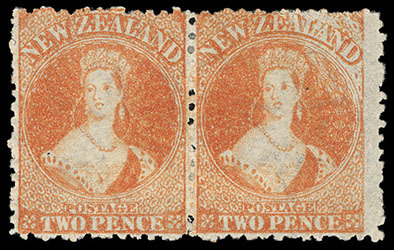 New Zealand, 1871, Queen Victoria "Chalon Head", 2d orange, perf 12½, Large Star watermark, horizontal pair (R. 14/11-12), o.g., two hinge remnants, well centered, bright radiant color with light impression top right, exceptionally fresh and Very Fine. Scott No. 40. Campbell Paterson No. A2s (2). SG No. 133 £360 as singles ($470). 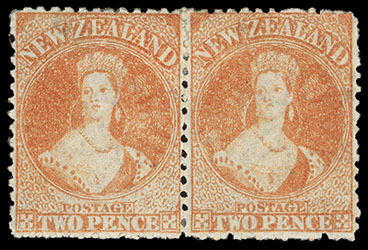 New Zealand, 1871, Queen Victoria "Chalon Head", 2d orange, perf 12½, Large Star watermark, horizontal pair (R. 17/5-6), Pos. 17/5 retouched, o.g., separations hinge reinforced, exceptionally well centered, bright color and paper, fresh and Extremely Fine pair. Scott No. 40. Campbell Paterson No. A2s (2, W). SG No. 133, 133a £480 as singles ($630). 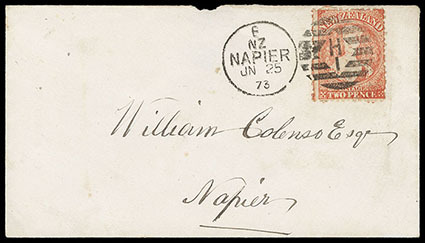 New Zealand, 1871, Queen Victoria "Chalon Head", 2d orange, perf 12½ (R. 18/6), Retouched, Large Star watermark, deep rich color, well centered, tied by bold "HI" barred oval duplexed with "Napier, JN 25, 73" cds on local drop cover; no back flap with small top edge nick, a Very Fine drop use. Scott No. 40. Campbell Paterson No. A2s (W). SG No. 133a Estimate $200 - 300. 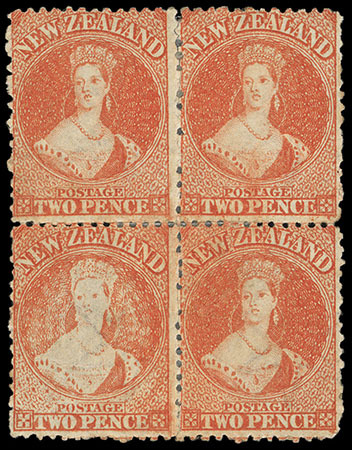 New Zealand, 1871, Queen Victoria "Chalon Head", 2d orange vermilion, perf 12½, Large Star watermark, block of 4 (R. 15-16/10-11), Pos. 16/10 retouched, o.g., separations hinge reinforced, rich radiant color, Fine and scarce. Scott No. 40a. Campbell Paterson No. A2s (V). SG No. 134, 134a Estimate $300 - 400.